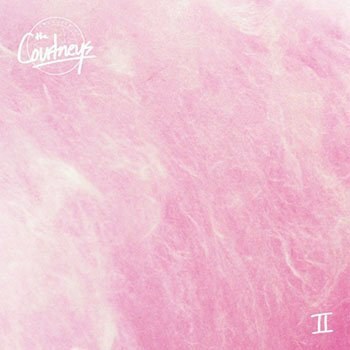 The Courtneys' sophomore release unfortunately lacks the fun that surrounded their debut. Growing up is a normal part of life. Your friends know it, your heroes know it, and the Courtneys sure do, too. The Courtneys II shows that coming-of-age element by sapping the energy that made the band's debut so great. Instead of feeling like the band hit a candy shop, leaving with Jolly Ranchers and packs of Nerds, they've become people who have realized how boring the long road of life is. This is not a group who felt it mandatory for a sophomore effort to feel like a growing up point, yet, perhaps unintentionally, that is what has become of the group with this effort. These efforts are not completely in vain, however. In showing the pains of heart in growing up, this Vancouver-based band indicate their flexibility and ability to handle subjects beyond love. The catchiness of such tunes disappear with this change, mostly because of the duller, lax vocals by Jen Twynn Payne. On the debut, pumping “Manion” or “Delivery Boy” and shouting lyrics through blazing hot windows is a fun experience. Developing a band's sound and maturity can be important, but to break the mold the perfect blend of seriousness and joy needs to be vicarious, something II does not accomplish to the fullest. One of the biggest issues is the uncoordinated instrumentation. While the tone of songs can be grasped from its lyrics, the Courtneys deliver a wonky combination of strings and vocals that make tracks feel loose and unpredictable. These characteristics would settle better in art pop, a genre this record is not. Courtney Loove’s strings feel dirty and gritty along Payne’s clear vocals, to the point where the mishmash makes concentrating on melodies a chore (“Minnesota”, “Virgo”). The band feel like a more distorted version of Best Coast, talking of love and getting away from the world. At times, they do yield surprising results, such as “Iron Deficiency”, one of the album's stronger tracks. It's a steady rebellion against aging that bears a resemblance to Courtney Barnett. The distortion works along the structure of the chorus. It might not be happy or fun, but it is a breath of fresh air from the more superficial songs like “Silver Velvet” or “25”. There is still fun to be had on the album, but in small doses. “Lost Boys”, like its title suggests, presents a vampire love story: “You look just like you did in 1986 / and that’s why you’re my vampire teenage boyfriend”. The track's melody is uninteresting and the bored-sounding vocal does not help, yet the hypnotizing lyric surprisingly captures the tone of the Cure and New Order. This is a track to actually dance to, one that indicates an adventure within. The distortion and melody are there with purpose, not feeling confused in the slightest. “Mars Attacks” feels this confusion, yet its chorus brainwashes with its freaky tone. Feeling less Mars Attacks and more Stranger Things, this is another song that captures with its weirdness. The Courtneys have grown up, but in the tradition of many sophomore releases, it is not enough. Perhaps sophomore pop albums should not represent a sort of finish line: it should indicate a point of confusion, one where bands should say that it is okay to not know what to do, then work around that. II certainly does that with a few tracks, but it is not enough amongst the glaring distortion.